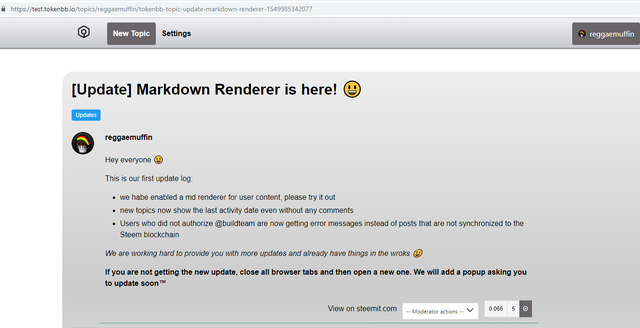 On behalf of @buildteam I would like to introduce you to SteemEditor, the new Vue Markdown Editor Component build for the Steem Blockchain. We forked from https://github.com/hinesboy/mavonEditor which @steempeak is currently using (they are planning to switch to our editor too). The TokenBB project is already using it. Every frontend on Steem needs a markdown editor. And to be honest, they are all somewhat broken and either don't do enough or do so much that they become a security risk. When we were building TokenBB we were facing the same problem. We asked the @steempeak folks how they handled it and they told us they were displeased with their current editor but strapped for time to replace/fix it. So we went to leverage the power of open source to the advantage of Steem. The editor we are developing comes with a MIT license of do almost whatever you want and encourages forks and change. It is used in real projects and will be ready for Steem markdown out of the box. Important security features have to be implemented once and automatically work for all frontends using it. And everyone can contribute to it, powered by @utopian-io. 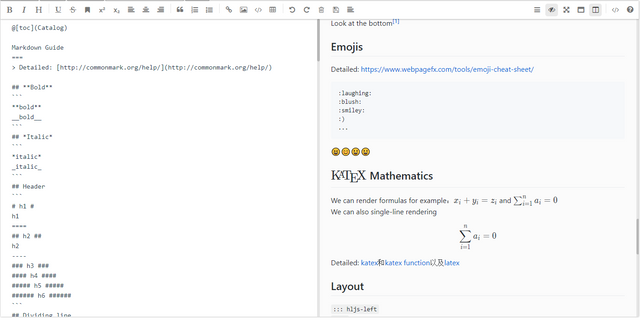 It supports emojis (also auto replaced ones like :) and :tm:), allows latex formulas, code in many syntax highlightings and many more. Try out https://md.zhystar.com/ for a big list of features supported already. Using such a versatile markdown renderer will allow us to easily add new formats to our markdown, maybe render dtube videos inline or display SteemMonsters cards with a >Selena Sky<, the sky is the limit. So we first checked all existing pull requests and included the ones that made sense. Then we updated all dependencies to new versions to fix some security issues with outdated packages. Since we use the same renderer the editor uses, all formatting will be exactly the same as the editor preview window shows. This gives the user predictability about how their post will look and saves frontend developers time that they can use to develop awesome features instead of fighting weird formatting bugs. The goal of this editor is to be the de-facto default editor of Steem. It will be used is popular frontends and therefore we expect new features to happen when users request them. The end goal would be to have new frontend developers add the vue component into their app, change about 10 lines of code and have a working editor with preview and renderer that works in ways users are used to and happy with. We plan to utilize utopian task requests to add new features to our editor and to reward contributors as much as possible. Many Steem users will thank you for your contribution. First off: thank you for wanting to contribute to steem-editor! Great article and initiative, this is big. An easy way to mark down our post is key to the blockchain adoption I believe. Awesome job on picking up the project and giving it a new lease on life for the benefit of us all. I look forward to the many task requests and the involvement of the community with @utopian-io #ideas as well. We recently switched to a different markdown editor on actifit.io since the old one was not working as intended. It's great to see you guys improving this one as well, we will definitely look into it! Sweet. I hope to see this project thrive. As a dev that has worked with SteemPeak the mavon editor has always been a pain for us. From a grateful Steemitizen. This is great! It is fantastic that the people with the coding and technical expertise are working hard to fix those issues that have sorely not been addressed or totally ignored by others. Kudos on a job well done! Ich finde diese Idee erstklassig. Darauf haben wir schon lange gewartet! Ich hab da zwar keine Ahnung von, aber es erscheint mir interessant für viele Steemians - also klarer resteem. Nice project. Thank you. Im checking it out. Sangat bagus posting mu kawan,terimakasih yang sebesar,besar nya.luar biasa. Love the work you've done here! Talking with our WordPress bloggers who use @SteemPress, a point that comes up time and time again as to why they don't invest more time and energy on their Steemit blogs is the lacking quality/capability of the editor. Have support LaTeX or equation? Improvements and development on the steem blockchain are pouring in all directions. It will not be surprise to moon this platform in the next couple of years. This Steem platform seems so exciting as i see projects like this just being developed for everyone to use. I just wish all this Steem blockchain stuff does could be made simpler to understand how it all works. I believe for mass adoption to happen, dapps and crypto need to be so easy to understand that a toddler would get it. Happy to see this! I'm using react in my projects like the majority of open-sourced Steem dApps (Condenser, Busy, Steemhunt,..), do you plan on a similar project for react or is there a great react markdown editor already? I am not sure about the editor options for react, but we might make it portable to other frameworks if enough people want it and are willing to contribute to that effort. Me parece muy interesante la propuesta y estarè incursionando en el line de conjsulta para conocer màs acerca de steem-editor. Gracias por este tipo de informaciòn.